Volunteer weeding guide - Help Yourself - Public Access Food Forests in Mass. This guide has instructions for weeding garden beds, and some context to think about while doing so: Anyone can help weed a HYS bed, even for a few minutes - you don't have to be an ongoing volunteer! Scroll down to see the plants in question, below! weed |wēd| (noun): a wild plant growing where it is not wanted and in competition with cultivated plants. (verb) to remove unwanted or inferior plants from an area of ground or garden. wild |wīld| (adjective): 1 (of an animal or plant) living in the natural environment; not domesticated. (of people) not civilized; barbarous. 2 uncontrolled or unrestrained. Weeds aren't bad, evil, foreign, invasive, out to kill your plants or ruin your day. Rather than growing out of spite, they are volunteering to live in a habitat they thrive in - disturbed and turned over soil. These plants arrive first after an earthquake, meteor or landslide destroys the forest in an area. Like a skin graft they cover the exposed tissue of life, soil. Over time, herbs and grasses give way to shrubs, brambles and finally trees in a natural process called succession. In this part of the world, life wants to make old growth forest. Conventional farms and gardens work against that trend by maintaining tilled soil. Controlling and restraining succession is a more difficult and energy intensive way to grow food than forest gardening. Since garden veggies tend to be heavy feeders - needy plants selected for massive fruits, they require human assistance for their success, especially from weeding. Plants share nutrients between themselves, through a network of roots connected by mushrooms. Plants are beings that live on the same planet as ourselves. We are both twigs on the same family tree. Therefore we are actually and literally cousins, not just in a metaphorical or technical sense. Can you approach weeding, like any interaction with a plant, as a 'family reunion moment'? We have a choice in how we approach this task. Are we vengefully killing bad-guys who have immigrated into our garden illegally? Or are we gently killing our living relatives, who we recognize have chosen to live in the garden to help return it to old growth forest, whom we ask to sacrifice their bodies so that we may keep these gardens accessible, and that the vegetables we've planted may thrive? We can weed with respect for the powers of plants, and gratitude for the gifts they offer the community of life. While cultivated vegetables are often larger than their wild counterparts, they are not necessarily more edible. Many so-called weeds are delicious, many times more nutritious and easier to grow than cultivated veggies. However, we humans put a lot of time and energy into our gardens in hopes that the veggies we raise from babies thrive and ripen so that we can eat them. Much of this work involves pulling out plants we did not plant ourselves - plants which arrived by seed or root from beyond the boundaries of our gardens, a region we call the 'wild'. Help Yourself! aims to keep its public plantings, especially vegetable beds, as weed free as possible. We want the veggies to be large, familiar, recognizable, and high yielding. We want the public to feel these gardens are accessible and inviting. We want to model well maintained and cared for gardens, demonstrating strong organizational capacity of the project. Keeping them beautiful in the more conventional eyes of powerful institutions in the area, who may consider proposals to transform their lawns into edible landscapes, will lead to more opportunities for public edible landscaping. HYS plantings are maintained by volunteers. Can you plug in for even 5 min. at a garden bed, right now? How about once or twice a week, or every time you pass one by? Consult the plant list below, and weed on! Feel free to invite other folks to help. If you come across ripe vegetables, by all means help yourself! You can move the 'ripe now!' signs around the garden as appropriate. Pull the plants gently out of the soil, trying to get their roots. They come up easier if the soil is damp, like after a rain. Shake the dirt of the roots back into the garden beds. Check for seeds or fruits on the plants. If there aren't any, you can lay their bodies back down in the garden as mulch, root side up so they will dry out and die. If there are seeds or fruits, don't put them back in the bed. You can make piles in the paths, and dump them nearby. Help Yourself offers free local produce in exchange for weeds pulled from planting areas. You may redeem the foods yourself, consult the plant list below for more information! In addition to eating them, you can dry many species for tea, make tinctures for medicine, salves for skin conditions, compost, string, chicken food, and more. Remember that wild plants are many times more nutritious than cultivated vegetables, are organic, have medicinal properties, and are free and abundant! Please read and familiarize yourself with all of these 'weeds'. Many plantings have uncommon and slow growing plants put in intentionally for ecosystem functions. Don't kill anything if you aren't sure who it is, and don't forget - most of these are good food, so take the produce home with you or snack away! Grass: weed from vegetable, raised beds, herb, flower and pollinator beds. Pull if growing inside mulch circle around perennials. If grass grows up to the trunk of a fruit tree, leave it until we can get a guild establised. White clover: edible leaves. Nitrogen fixer. Don't pull out! Leave in the garden to fertilize soil. Ragweed: source of late summer allergy, not goldenrod. Pull in all plantings. Garlic mustard: edible raw or cooked, spicy leaves. Mustard made from seeds. Pull in plantings. Lamb's quarters (goosefoot): edible. Leaves in salad, stirfry. Seeds like poppy. Dandelion: edible. Flowers, leaves in salads or cooked, root as detox tea, cook like carrot. White sap leaks from toothed leaves. 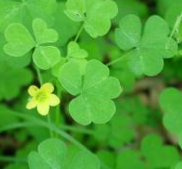 Wood sorrel: edible. Refreshing sour leaves, flowers and small star-fruits. Leave in plantings, also leave sheep sorrel. Staghorn sumac: edible. red fruits source of pink lemonade, sour spice. Pull shoots in areas near sumac stands. Peeled, flimsy young stalks are a great wild veggie! Oriental Bittersweet: inedible, toxic berries. May grow as sprouts or seedlings in areas near woods. Pull small vines with yellow roots. Vines used for baskets, rope. Wild lettuce: ancestor of lettuce. Bitter leaves with slightly spiny ridge and white sap.Medicinal: sedative. Pull in plantings.